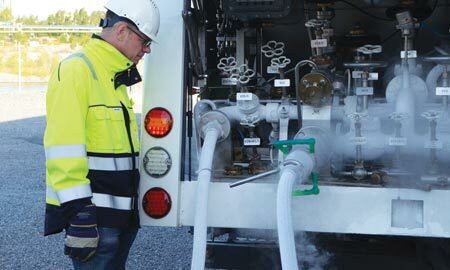 Dry disconnect cryogenic couplings from Swedish manufacturer, Mann-Tek, takes the uncertainty out of handling LNG and other cryogenic liquefied gases. 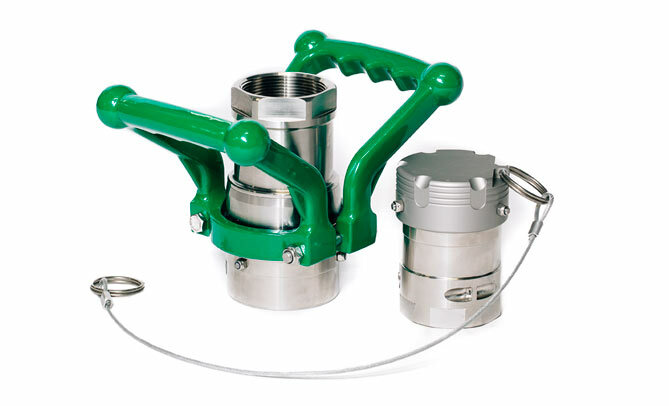 Mann-Tek’s robust product design and quality manufacturing processes create a coupling system that reliably eliminates human error and prevents spillage. Safety and reliability concerns are paramount in situations where hoses and pipelines must be connected and disconnected under pressure. Transfers of LNG, Nitrogen, and other cryogenic liquefied gases can now be performed in safety and confidence with Mann-Tek’s LNG coupling system. Mann-Tek Dry Cryogenic Coupling consists of two units: (1) the “tank” unit, which is a type of non-return valve, and (2) the “hose” unit, which has an internal cam for opening or closing the valves in both units at the same time. It’s easy to connect the coupling and open the flow path. An initial push and turn action on the hose unit provides engagement with the tank unit: locking and sealing the two units together. A single-action, straightforward turning motion connects the couplings and opens the flow path. Further rotation opens the internal valves and allows full flow while still maintaining pressure. Learn more about the advantages of Mann-Tek couplings from the knowledgeable sales staff at Arm-Tex Distributors by calling 800.536.1983 today!